I’m enjoying to read something about the Spitfire KH-H.
My later grandfather witnessed the downing of this aircraft and he described it with nearly the same words. He was a German soldier who had sentineled the crashed Spitfire. And he took a picture of the KH-H.
John Engelsted commented on EN130, code KH-F.
Time frame is February to October 1943 because of the aircraft – EN130 KH-F. So this picture would have been taken during the same time period. And the pilots would have been flying with Jimmy right? We can search for names using the ORBs on Air Force Association of Canada. Website. And the picture looks to have been taken during the summer of 1943 by looking at the foliage and before he was shot down. Pictures sent by Dean Black. Pilot sitting on aircraft: this is Jimmy Abbotts. 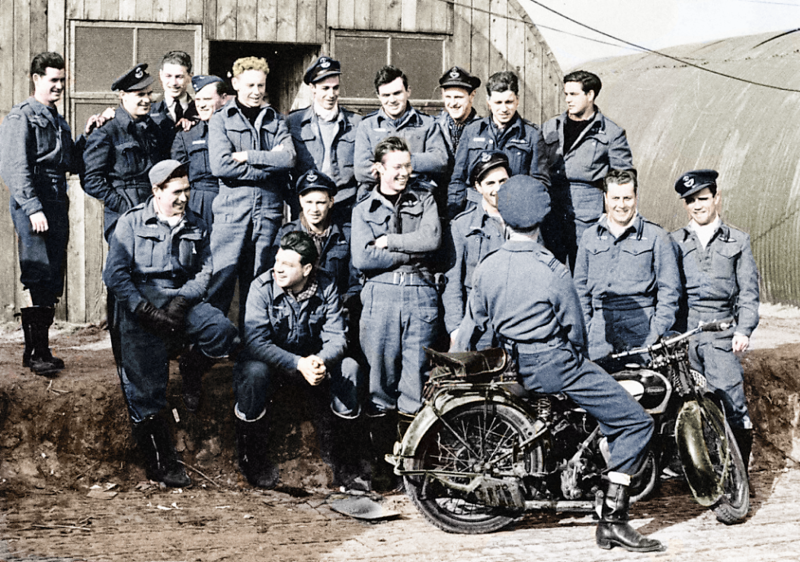 He can be seen second from right in the second photograph of a group of 4 pilots. Perhaps your blog readers can identify the others? 1. Enclosed herewith is a letter received at this Headquarters through HQ B.A.F.O. and the R.C.A.F. Staff Officer, Fighter Command, from Albert Philipps of 29 Ambachstraat, Hillegom, Holland. 2. The pilot was J.17204, P/O J.E. 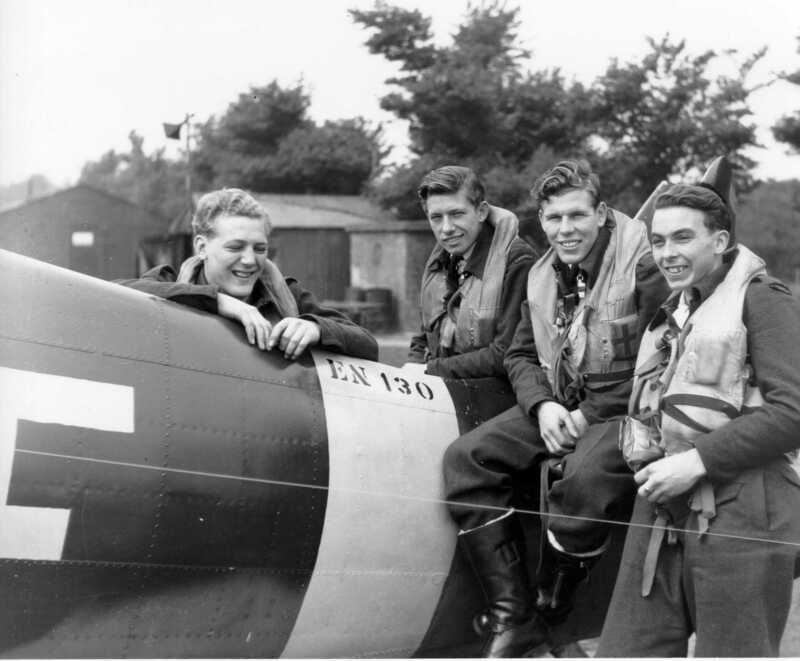 Abbotts, now repatriated, who was missing from 403 Squadron in Spitfire aircraft BS.509 on the 29th July, 1943, although on that particular mission, 12 Group Ramrod 22 to Amsterdam, he flew with No. 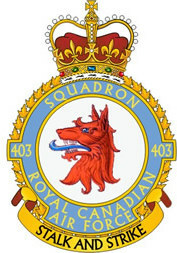 421 Squadron. 3. Steps are being taken to secure this propeller from Mr. Philipps for onward transmission to you and to make enquiries regarding the tie pin to which he refers. Concerning the letter that I received from Hillegom, Holland in connection with my crash landing. I would like very much to have it; I was very lucky to come out of it alive, and must have put on quite a show that day. I don’t remember much about it so if I may have the letter, I would appreciate it very much. I received the piece of my Spitfire propeller. Thank you very much! You also asked me to tell you about that day, July 29/43. My Squadron was 403 but I was flying No. 3 with 421 Sqn (short of pilots). After checking the Forts out North of Amsterdam, we were sweeping up and down at 30,000 feet. I spotted 2 – ME 109s below. Winco ‘Johnny’ Johnson told me to keep an eye on them; finally he said ‘Go after them’. I rolled out of the formation and was just coming up nicely through the odd puff of flak when something hit me; lots of oil and smoke. I fired anyway but was out of range. I started towards the North Sea but the engine quit, and a 109 was rolling over above to attack – I spun away to about 4,000 or 5,000 feet and decided to bale out. I rolled over and came out but hit the fuselage and was knocked out. When I regained consciousness, the shoulder strap of my parachute was around the aerial mast. I was hanging on the right hand side of the a/c, the a/c was right side up, wings level and in a nice glide. I held on with one hand and tired to tear the chute out, but I was getting too close to the ground. I decided that it was all over. And thought ‘I’ve had it’. I passed out. I woke up 3 hours later save in the arms of – Germans. Several letters from Dutch people tell me that the a/c just missed a house, belly-landed, jumped a ditch, went through a hedge and started to burn while I was still hanging on. They cut me free. That’s the story Sir if you can make it out. An English-speaking German said ‘One in a million’. I guess that he was right. This is a letter we had on file at 403 Squadron, after the war. This is about Abbotts, and how his plane came down. You will get a sense of what happened, after reading the letter. I still have the tie pin (Indian sword) mentioned in this letter. I made a mistake in my earlier post, about a piece of the propellor – it was actually the tie pin which I was presented, when I commanded 403 Squadron from 2000 to 2002. Herewith I let you know that I would be very pleased to come into conversation with a Canadian pilot who landed on one of our Bulbfields in Hillegom, Holland on the 29th of July, 1943. It happened in the morning on a beautiful day, probably during an air raid on the aerodrome of Schipol by a couple of RAF twin engined bombers escorted by fighter planes (Spitfires). The weather was beautiful, but the sky was dampy (fog) so we could not clearly count the bombers and the fighters we just only could hear. Suddenly however a plane came down circling around with its engine heavy smoking. We noticed at once when it came out of the damp that it was a British fighter. The lower it came the more scared we got because we didn’t know where it should come down, because of its circling around. You should have seen the workers in the fields, they were also running a circle. When the plane came lower we saw the pilot was hanging besides the plane near the tail. His parachute was hooked on the little radio mast, behind the aviator’s seat. He was a lucky fellow, because the plane came on the ground all by itself with not too much speed, after flying over the roof of a little house with it missing it by a few inches. The aviator was dirty and black from sand and mud, and injured not severely. I asked what he was, and he said a ‘Canadian’. Then I had to shut my dirty mouth, so as the German soldiers said to me, which showed up by that time. I stole the plane’s propeller (it was a wooden one) and probably the aviator, which is now of course out of prison camp might like to have it as a souvenir of that plane which did his duty so wonderful to save his life by landing so beautifully all by itself. 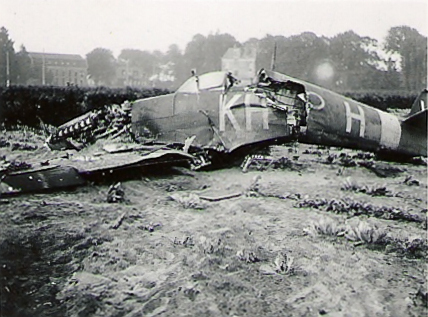 The plane’s number was KH-H49. BS 509 Spitfire. Please be so kind and let me have the pilot’s name and address or you might tell him about this letter so we could come into connection with each other, and he can have the propeller if he wants it as a remembrance. Another man found a beautiful tie pin near the plane, which might be from the pilot. It has the form of an Indian Sword (Klewang). The man still got it, and don’t know if he likes to keep it. I think he will, but it is the property of that aviator probably, and it might be a very worthing remembrance tie pin which he would like to have back (from his mother, father, or girl or wife). I hope you will do all you can to find out the aviator’s name, so we can come in touch with each other. Thanking you for taking notice of this letter. Forgive my poor English writing. Hope you understand it. The original will follow this other comment made by Dean. I have a copy of the newspaper article, but it has been many years since I looked at it. However, I seem to recall it was a single vehicle accident and alcohol was a factor. I also want to emphasize, Herman van Amsterdam said he is writing a book, and he wants to explore what he describes as…”an emergency landing…”. If you want to write a book, as an historian you cannot describe this as an emergency landing! Abbotts bailed out. He departed the aircraft. He took to his parachute. If you insist on calling this an emergency landing you had better state God was at the controls. This aircraft was trimmed in a certain way, that when presented with the flight balance resulting from Abbotts’ unconscious body, tangled with the parachute draped over the antennae, the aircraft itself entered a very flat spin, in a circular descent, losing about five feet of altitude for every full circle the diameter of which probably measured five to eight aircraft wing-spans. The touchdown was upright, and Abbotts was uninjured. Witnesses on the ground watched the whole thing, and they could not believe the pilot was still attached to the aircraft and survived. I contacted the Abbott family about ten years ago. The amazing story about Jimmy Abbotts is that he survived the crash-landing of his Spitfire. Few readers might appreciate from the brief description above, but Abbotts tried to bail out of his Spitfire, but his parachute got tangled up in the aircraft antenna and cockpit riggings. Miraculously, even though Abbotts was unconscious the aircraft entered a balanced and very shallow spin – no one was at the controls and Abbotts unconscious body was hanging out one side. As the aircraft spun in an ever-decreasing diameter turn it narrowly missed the top of a barn, by inches, before “landing” ever so softly in the field beyond. Everyone on the ground witnessed this “crash”, and upon reaching the aircraft Abbotts only just began to wake up. When I spoke to the family in 2003-2004 I learned that Jimmy Abbotts died in a drunk-driving accident in the 1950s. The family sent me a chunk of Abbotts propellor – something he had held onto for many years. I will share pictures of Abbott with Pierre. 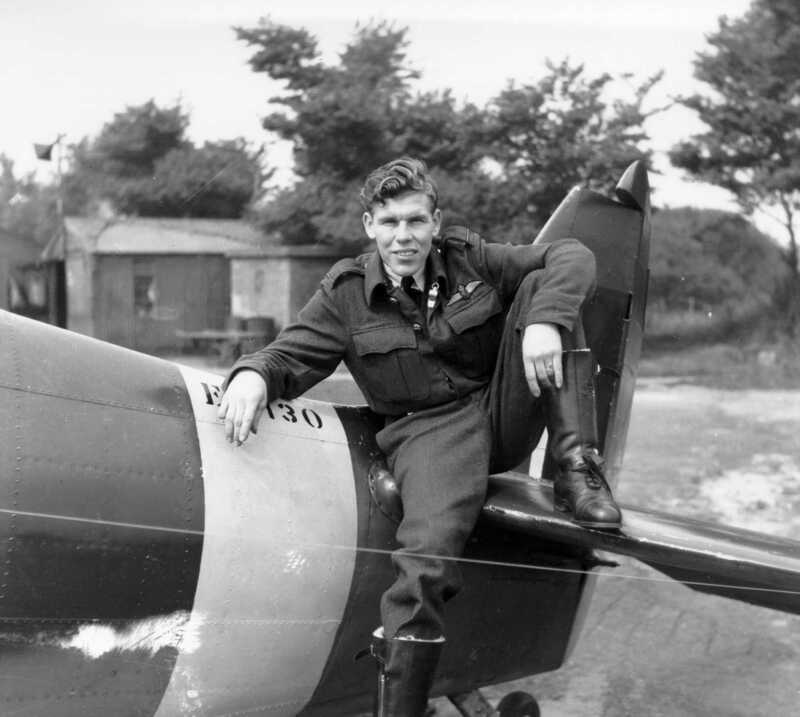 I am working on a book about WW2 and still searching for additional information on Spitfire-pilot Jimmy Abbotts (403 Sqn). At the end of July 1943 he became a prisoner of war after an emergency landing in the village of Hillegom in the western part of Holland. After the war he returned to his hometown Owen Sound. I love to get in contact also with his family. Anybody any suggestions?